Before I got round to drawing up firm plans for the wharf on Bow Creek the Scale 7 Group decided to throw down a challenge to it’s members.This was to build a layout to S7 standards within an area of no more than 33 sq. ft. I looked at this as the push I needed to get the ball rolling with my own layout, I figured that it could be built as a seperate unit which can be exhibited but also “plugged in” to the main layout that will be built at a later date. So onto the drawing board and I have come up with the design shown here. I have utilised the full 33 sq. ft. which includes the sector plates and stock storage roads, these I have managed to contain within the warehouse buildings at the rear of the layout. This plan shows the layout in it’s exhibition format, but when attached to the main layout the wagons would be tripped round from the marshalling yard leading in from the right hand side behind the old granary, across Boat St. and through the gates of the wharf which are shared with the road traffic.The left hand side would also be extended when attached to the main layout and here will feature a timber yard. In time I will draw up plans for the other main areas and post them here, but for now I wil concentrate on this section for the S7 Group’s Challenge 33. 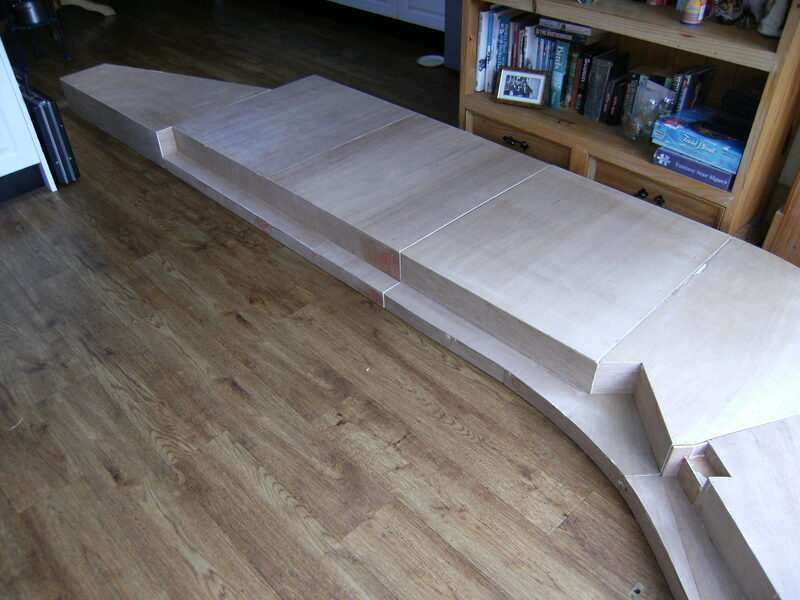 Well it’s been a while since I last posted but finally I have got around to building the base boards that will support Bow Creek Wharf. 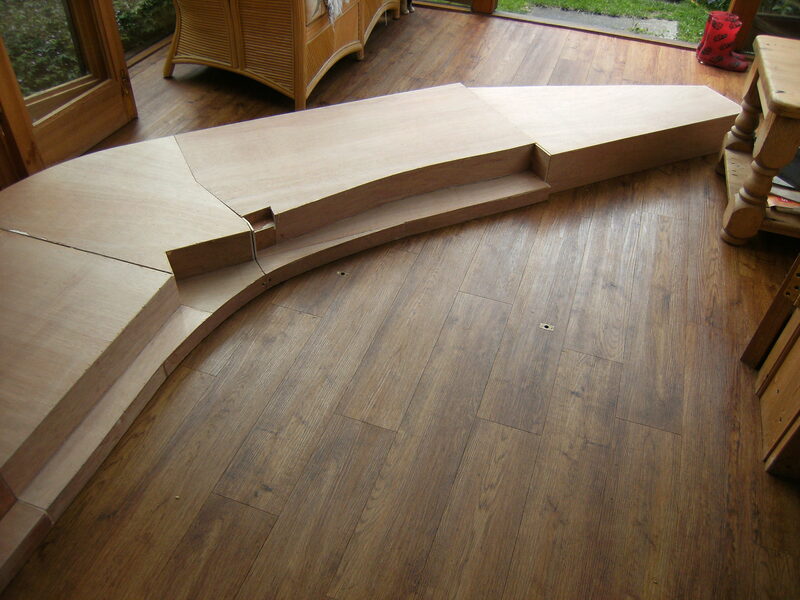 Main construction is from 6mm ply with housed joints using the router, glued with 5 min. 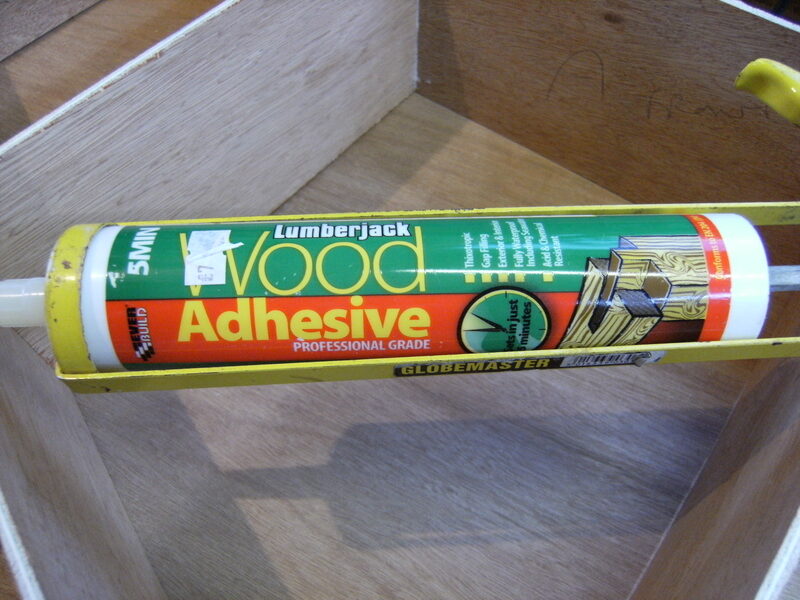 polyurathane wood glue and tacked with the nail gun using brads. 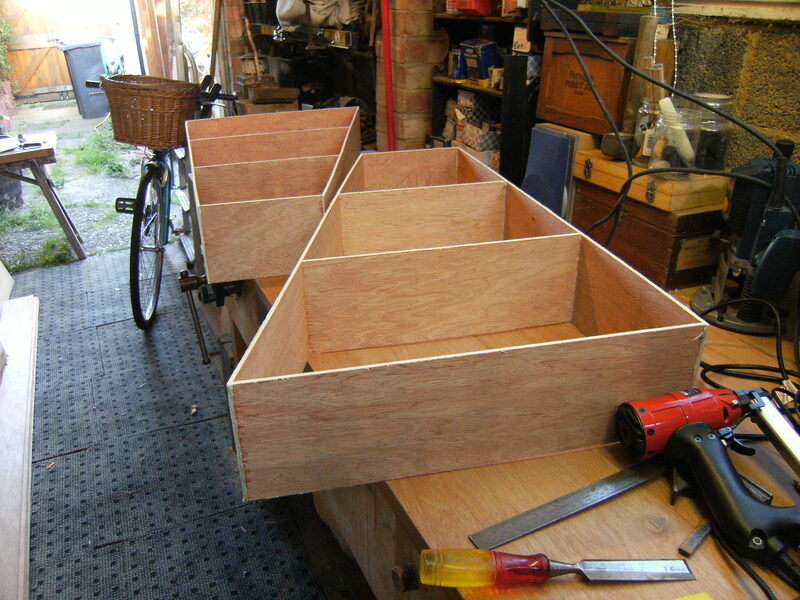 4mm ply is used for the top surfaces which holds it all square and again this is glued down and tacked with the nail gun. 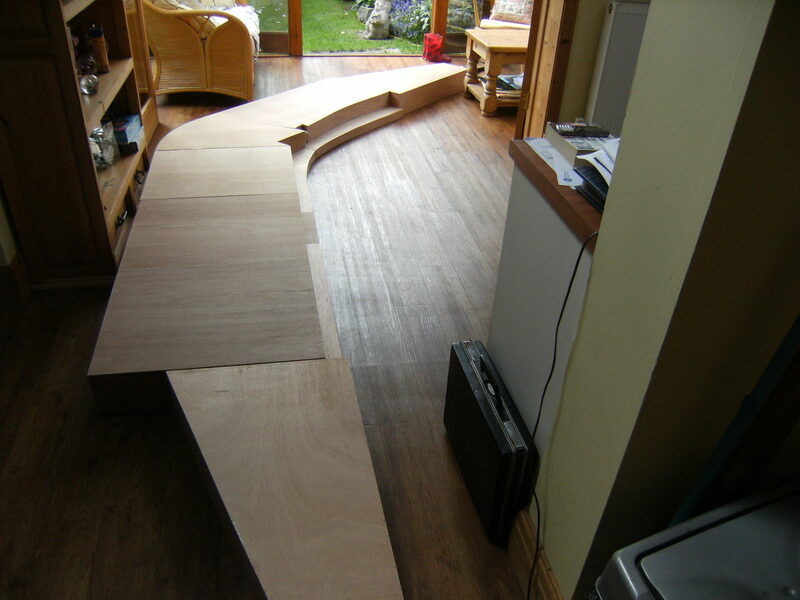 The surface will be covered with 12mm Sundela. 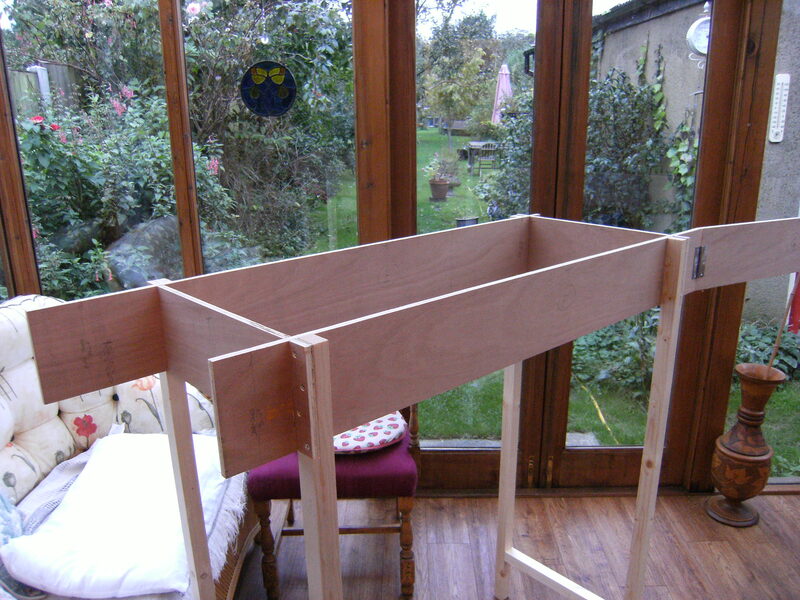 The trestles are simple frames of ex 2″x 2″s/wd with a 12mm ply top rail 6″ deep and slotted, half their depth to hold the 12mm ply support rails. This all makes for a light weight, easy to assemble/dis-assemble system with out the need for bolts to hold it all together. 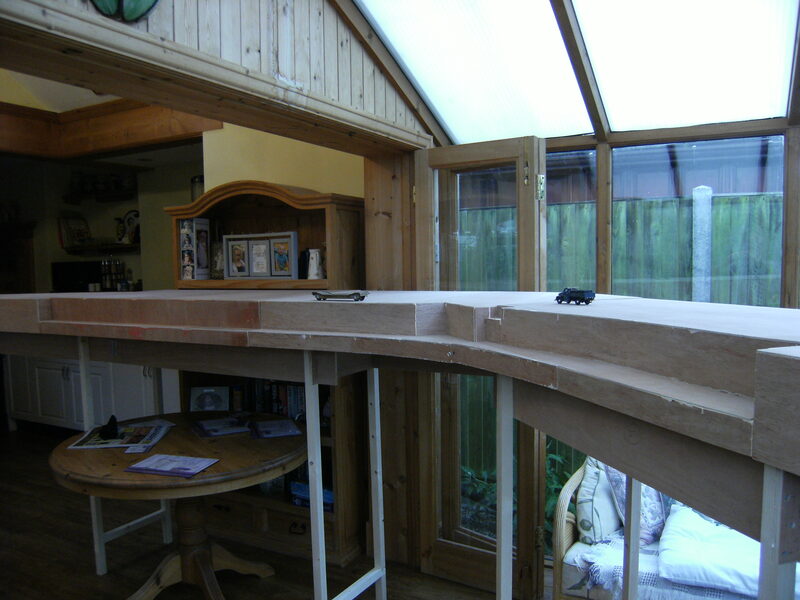 The baseboards will have a means of being held to the rails to stop them being moved and this I will describe soon. Just discovered your site. Fascinating. I grew up in east London in the 50’s and 60’s and was a regular grubby kneed spotter at Stratford. For various reasons, as a kid, I travelled the North Woolwich branch often behind N7’s and L1s on the Palace Gates shuttles. 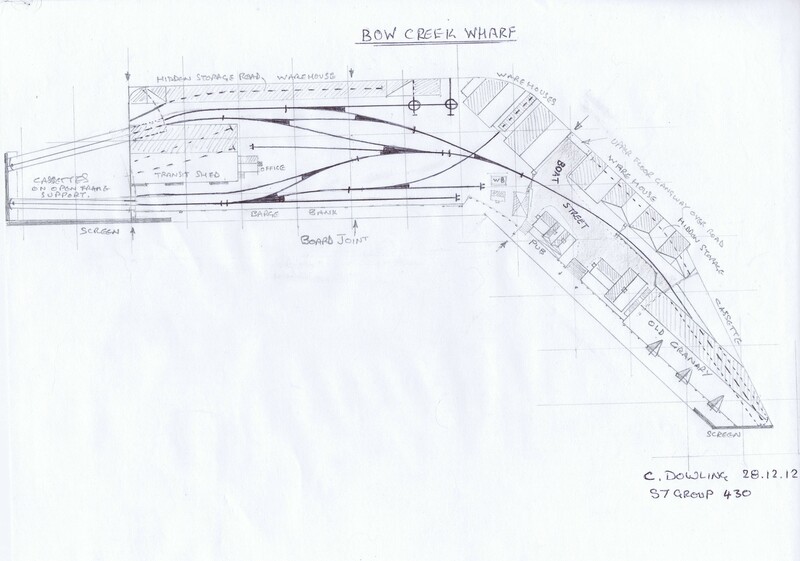 Your observations on Bow Creek are spot on accurate. J67/8/9s dominated the freight traffic with J15s and 17s,and Y4s for the tight radius curves. But the line also saw a much wider range of motive power, with a few suprises. There were a lot of LMS/Midland visitors. Plenty of Jinties, and Fowler 4Fs. I also saw Black 5’s, Ivatt ‘Flying Pigs’, and sometimes 8Fs on transfer trips from Brent or Cricklewood yards. Also, more than once, Q1s, presumably originating on Feltham -Temple Mills runs and then being ‘borrowed’ for a quick trip down to the Royals. My best ‘exotic ‘ was a Crab that was on the books of Lancaster Green Ayre depot. The next month’s TI reported it as being at Brent. Their correspondent missed ther fact it clearly was pinched by Willesden for one of their cross London transfers to the Royals. From the GN section Hornsey based J50’s and 52s had regular turns, plus on one occasion I remember an N2 on freight . You are right about the types which dominated but in fact the full range of freight power available at Stratford went down the branch regularly, thus I accurately remember J19/20 and J39 0-6-0s,WD 2-8-0s, and K3s. Standard 2-6-0s of the ’76’ series which were at Stratford were often used. Any of the above locomotives would be legitimate on your layout, especially if you are including a representation the Bow Creek exchange sidings. My uncle was a mechanical engineer at Stratford during this period and he often slipped me on the QT at week ends if he had to go in for any reason. So I had priviledged access to a lot of interesting info. Sadly I didn’t have a camera in those days. Happy to correspond with you sometimes if you like. Thanks for some very interesting info. about the loco types used in the area. Apart from the E.R. loco’s which I knew about it’s good to have first hand account of the M.R. motive power that also came through on transfer freights, something I would want to replicate.